The Treaty of Versailles of 1919 is the peace treaty created as a result of six months of negotiations at the Paris Peace Conference of 1919, which put an official end to World War I between the Allies and Central Powers. The treaty was a follow-up to an armistice signed months before in the forest of Compiègne, which put an end to the fighting. The treaty required that Germany claim full responsibility for causing the war, and pay large amounts of compensation (war reparations) to the allies. Germany also lost territory to many surrounding countries, had its military forces severely limited and was stripped of its overseas and African colonies. Representatives of the new German government (Weimar Republic) were forced by the victors to sign the treaty, otherwise fighting was threatened to begin anew. Thus Germany's foreign minister, Hermann Müller, undersigned it on June 28, 1919. 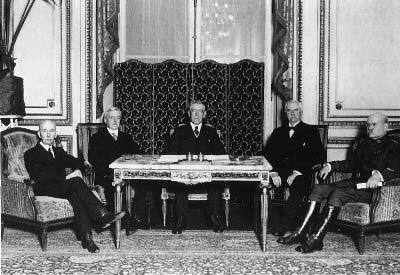 The treaty was ratified by the League of Nations on January 10, 1920. In Germany the treaty caused a shock—often referred to as a trauma or anti-Versailles-complex— which eventually contributed to the collapse of the Weimar Republic in 1933, and thus Adolf Hitler's rise to power.